Green_9_x_12_Envelopes is rated 4.8 out of 5 by 6. 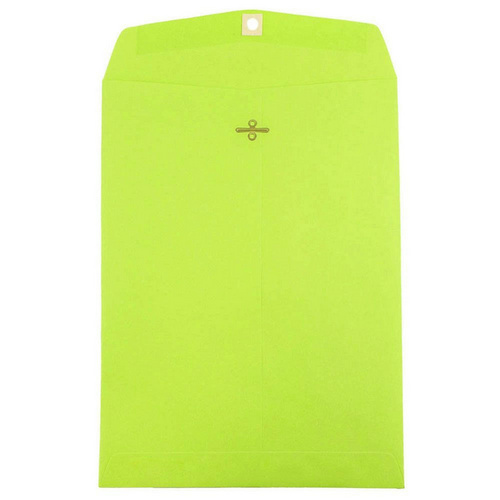 Rated 5 out of 5 by Burrton Ks from Large Lime Green Envelopes Ease of ordering and quick delivery. Very nice product received. Rated 5 out of 5 by Casa from Great service! Nice Quality! Fair price! Very happy with my experience as a whole, great selection of choices for reasonable prices. I work at a dealership and we had a problem locating the received shipment and Jam stepped up to the plate with excellent service! Rated 5 out of 5 by JeanneR from High quality I have bought this style of envelope several times from Jam. Nice thick paper, well constructed, good gum seal. Booklet style makes it easy to insert report, and easy for clients to remove material. All the colors are clear and bright, lime is my favorite color. I will be buying more products from Jam! Rated 5 out of 5 by Kathleen from Love the color! I wanted lime green envelopes in the size I ordered. Only lime green would do and you had the exact color I wanted in multiple sizes. No more creases, no more bends. No more bores, only trends. With our Green 9 x 12 Envelopes, you are certain to keep your standard pieces of paper protected and safe from those messy creases they certainly don't like (and you don't either). When you want to keep your papers intact but also give a little color into the mix, green is the way to go. It will show that you're not too loud but not too afraid either. With a variety of different shades of green and designs, you are sure to find one that speaks to your purpose. Whether you're writing a thesis on 'going green' or want to store your work documents in your favorite color of all time, 9 x 12 Envelopes are the way to go. Green 9 x 12 Envelopes are available in booklet and open end (with or without clasp). In 10 different shades! From Green Brite Hue (with 30% recycled content) to a christmas themed mistletoe foil envelope, we have it all!